I need to keep a good amount from this batch for breeding, but there will be many to sell and a couple more ooths due to hatch. Make sure you are on the wait list! 5 groups of D. lobata for sale, Memorial Day and Tuesday ONLY! I am selling 5 groups of 10 D. lobata (Dead Leaf) nymphs at $80 each plus shipping. This is for Memorial day, May 28th, and the Tuesday after. Only 5 groups available and only for those 2 days. Can be added to existing orders. These will be ready to ship the following week at L2 and will be big enough to eat house flies. Do not miss out! Email me if interested as I will need to manually add this order for you. 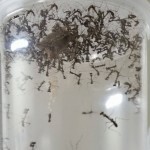 I have added some R. basalis and Camelomantis nymphs to the shop, however they will not ship out until either the 16th or 24th after they have shed at least once. D. lobata just hatched as well. I owe a friend a bunch from this ooth but I should have around 20 or so available. I will post them in a week once I am satisfied that the remaining nymphs are strong. They will be shipped the following week once they are L2. Add yourself to the wait list to be notified when they are ready. Orchids, R. fusca, and dead leaf nymphs soon. I should have orchids posted by Monday, May 7th. Please add yourself to the wait list if interested. Rhombodera fusca nymphs will be posted on Wed, May 2nd. This species is not often offered, so add yourself to the wait list if interested. Over the next couple of weeks I am expecting D. desiccata and D. lobata (dead leaf species), as well as Rhobodera basalis. I have some extra nymphs available. I do not want to add them to the stock as dozens of people will be notified from the wait list but only a few nymphs are available. I will update the list as I sell them, and add more as they come available. Yes, orchids have finally hatched. It will be a week or 2 before they start to shed. Once they do, I will post them. There should be about 3 groups, most likely around 2 weeks apart. Lobata and Idolomantis nymphs should shed in 1 week as well. D. lobata ooths are starting to hatch. Nymphs will be available as soon as they start shedding to L2. Orchids expected to hatch any day. Also expecting more wahlbergii, gemmatus, and ghost to be available soon. I have extended the idolomantis sale for a few more days as I had a few ooths hatch that I did not believe were fertile since I never witnessed mating (good thing I didn’t throw them out!). Idolo nymphs are available and shipping is back to normal. Shipping this time of year takes a bit longer, as I am sure many of you have noticed. Monday will be the final priority shipping day this year, and Wed will be the final shipping day for express packages. I strongly suggest express shipping until the new year, simply due to all of the delays. Priority shipments will continue again after the new year on Jan 3rd.